I've had this speaker for about 6 months now. Its in excellent shape and works just fine. I do not have the original boxes. Revolutionary Technologies. Engineered By Devialet. Our EVO Platform provides you with latest upgrades. Receive performance and compatibility updates direct to your Phantom. Wirelessly and hassle-free. 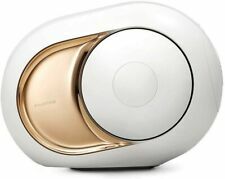 Devialet Gold Phantom - High-end wireless speaker - 4500 Watts - 108 dB. Condition is New. I'M SORRY. Phantom is the best wireless speaker in the world. Music : Play your music wirelessly from any device, streaming service or your own collection via AirPlay or Bluetooth. I used it less than 10 times. Perfect condition. Nothing wrong with it. No low ball offers. I would not take anything lower than 2400. Thanks. Devialet Classic Phantom Wireless speaker - ZP510US/AP. (Factory Sealed). Devialet Classic Phantom High-end Wireless Speaker and AC power cord. Our EVO Platform provides you with latest upgrades. Receive performance and compatibility updates direct to your Phantom. ACE™ is the technology responsible for Phantom Reactor’s radical spherical architecture. Drawing on Olson’s pulsating sphere principle, Phantom Reactor dramatically optimizes the way sound waves form and spread: evenly, and in all directions. Devialet Gold Phantom Implosive Speaker. This Devialet Gold Phantom Implosive Speaker is in good overall working condition. Devialet Gold Phantom Implosive Speaker and AC power cord. Devialet Gold Phantom Implosive Speaker 4500 Watts. Devialet Silver Phantom - High-end wireless speaker - 3000 Watts - 105 dB. Condition is New. I'M SORRY. Phantom is the best wireless speaker in the world. Music : Play your music wirelessly from any device, streaming service or your own collection via AirPlay or Bluetooth. Aluminum Tweeter driver. Silver Phantom specs Dialogue specs Phantom synchronisation via Wi-Fi, Ethernet or PLC. Spark (Windows 7 , Mac OSX 10.12 , iOS 10 , Android 5 ), Phantom Remote (iOS). AirPlay compatibility with the latest Dialog. Devialet Silver Phantom Implosive Speaker - DB245. This Devialet Silver Phantom High-end wireless speaker is in great working condition. Devialet Silver Phantom High-end wireless speaker and AC power cord. Dialog is the hub that allows you to connect several Phantom together wirelessly, from 2 Phantom to 24 Phantom, to create Hi-Fi or Multi-Room systems. Dialog is necessary to connect more than one Phantom for a multi-room or stereo experience. Perfect acoustic sphere from omni-directional sound experience. Up to 3000 Watts of intense power. Potential to connect two to twenty-four Phantoms via Wi-Fi to create hi-fi, cinema, or multi-room listening experiences. 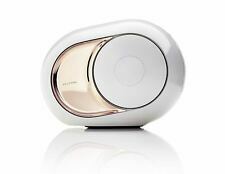 Devialet Phantom - High-end wireless speaker - 1200 Watts - 101 dB. Color:White (1200 W) | Style:Speaker only Phantom is the best wireless speaker in the world. Music : Play your music wirelessly from any device, streaming service or your own collection via AirPlay or Bluetooth. Item model number: DB245 BEST WIRELESS SPEAKER IN THE WORLD: This speaker from Devialet emits an ultra-dense sound with physical impact. No distortion, no saturation, no background noise and features our exclusive Analog Digital Hybrid Technology. Zero distortion, zero saturation & zero background: nothing but audiophile-grade playback, even up to 600W. SOUNDS XXL, LOOKS XXS: unreasonably compact for a system this powerful, Phantom Reactor fits in almost anywhere. BEST WIRELESS SPEAKER IN THE WORLD: This speaker from Devialet emits an ultra-dense sound with physical impact. No distortion, no saturation, no background noise and features our exclusive Analog Digital Hybrid Technology. Phantom Accessories: Revolutionary industrial design cutting edge engineering makes Phantom easy to live with. Phantom's skilled accomplice. Super intuitive. Connects easily to Phantom via Bluetooth. This is not a speaker. This is Phantom. The best sound in the world. Encounter the physical impact of a high-end ultra-dense sound. With power, clarity and precision unlike anything you’ve heard before. 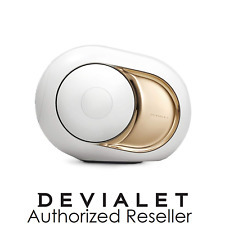 Devialet VY510US Accessory - Dialog - Wireless smart hub for Phantom. Manufacturer: Devialet Inc. Item model number: VY510US. Dialog lets you synch up all your Phantom systems from two Phantom in stereo to many Phantom in Multi-room. 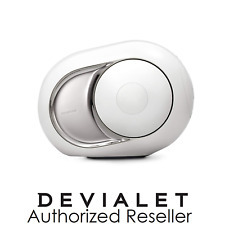 Devialet VY510US Accessory - Dialog - Wireless smart hub for Phantom. Manufacturer: Devialet Inc. Dialog lets you synch up all your Phantom systems from two Phantom in stereo to many Phantom in Multi-room. This is not a speaker. This is Phantom. The best sound in the world. Encounter the physical impact of a high-end ultra-dense sound. With power, clarity and precision unlike anything you've heard before. 3-pieces Devialet Phantom Dialog Audio Hub Bundle and Remote. We usually respond within 24 hours. 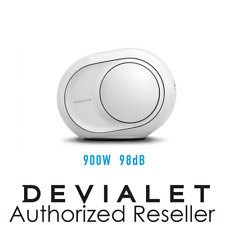 Devialet VY510US Accessory - Dialog - Wireless smart hub for Phantom. Dialog lets you synch up all your Phantom systems from two Phantom in stereo to many Phantom in Multi-room. Dialog is the hub that allows you to connect several Phantom together wirelessly, from 2 Phantom to 24 Phantom, to create Hi-Fi or Multi-Room systems. Manufacturer: Devialet Inc. Only works with Phantom Premier: Phantom Gold (4500W), Phantom Silver (3000W), Classic Phantom (1200W). Phantom's skilled accomplice. Super intuitive. Connects easily to Phantom via Bluetooth. This three-legged stand combines a sleek, lightweight design with ultra-solid support from an isostatic base. Three legs. Quick start guide. Dialog is the Hub Devialet that allows you to connect wirelessly several Phantom together, from 2 Phantom to 24 Phantom, to create Hi-Fi or Multi-Room systems. Phantom replaces all existing systems. Use one Phantom as the best dock in the world. DEVIALET SILVER PHANTOM IMPLOSIVE SPK. This Devialet Silver Phantom High-end Wireless Speaker is in great working condition. Devialet Silver Phantom High-end Wireless Speaker. 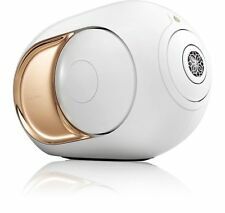 BEST WIRELESS SPEAKER IN THE WORLD: This speaker from Devialet emits an ultra-dense sound with physical impact.